Please use the “buy now” button below to make Paypal or Credit Card payments. If you wish to use another form of payment, all other accepted payment methods can be discussed at the time that your project is invoiced. “Mastered for iTunes” is an alternate version of your master created to the specifications of Apple’s “mastered for iTunes” guidelines. This includes leaving sufficient headroom as to avoid inter-sample peaks (clipping distortion) from occurring after your master is encoded to Apple’s AAC format. It also enables you to provide Apple with high resolution masters, with sample rates up to 96K and at 24 bits. This is a great solution with significant benefits if you plan to sell your release in the iTunes store. WHAT MIX FORMATS DO YOU ACCEPT? We accept WAV, AIFF, and SDII file formats at any sample rate and word length. If nothing else is available, MP3, AAC, and other compressed file types can also be sent, but these are strongly discouraged for best results. Your mixes can be delivered as multiple mono or stereo interleaved. I will send my preferred FTP upload methods upon session confirmation, or a free file sharing service like Dropbox can also be used if you prefer. All links to files or Dropbox invitiations should be directed to info@srmastering.com. You can also mail a CD-R, DVD, DAT tape, hard drive (flash, USB, firewire), and 1/4″ analog tape at 7.5, 15, or 30 ips (please email us for the studio address). 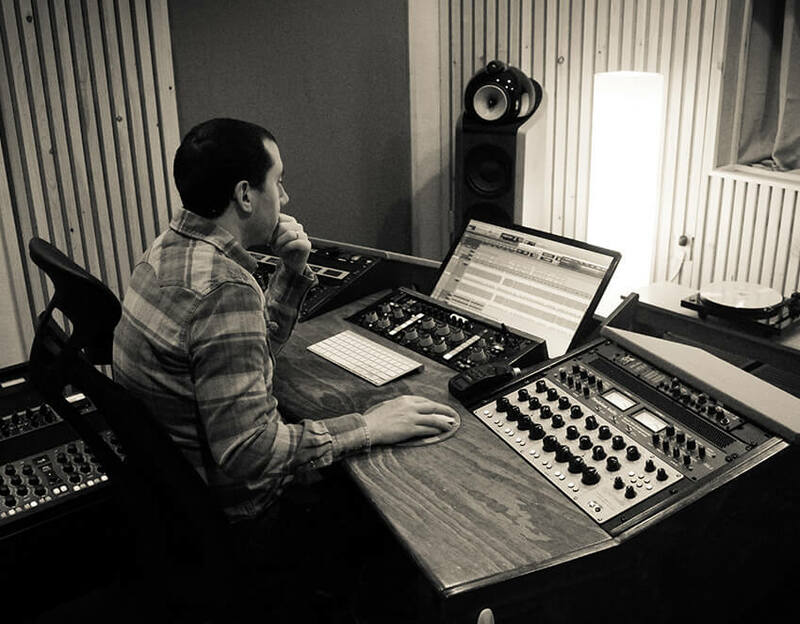 Typical turnaround time is within 7 – 10 days if you have your mixes ready for mastering. If you book your project at least two weeks in advance, I can be much more flexible and complete the job for a specific deadline, leaving room for revisions and other unforeseen situations that can occur. If you’re in a rush, I will do the best I can to complete the job quickly as long as there is room in the calendar, and at no additional cost. If your required turnaround time will affect other projects that were booked in advance, then added fees may apply. SHOULD I REMOVE MY BUS COMPRESSION? Unfortunately there is no “one size fits all” answer to this question. In some cases, it’s better to leave dynamics processing OFF of your mix before sending it in for mastering. Mix compression is an artistic choice and if you’re getting something that you want out of that compression, then by all means… go with it! My only “hard-line” is to avoid using brick wall peak limiters, as they can really steal transient impact and make things a bit “crunchy”. I also encourage printing mixes with peak levels that fall between -6 to -3 DBFS. I welcome the submission of compressed and uncompressed versions of the mixes, so that we can decide which works best after a mastering sample is done from each source. If your only reason for using the compressor is to make the mix louder, then it’s probably best to remove it. CAN YOU MAKE MY MASTER LOUDER? In most cases, yes. The question is, what will it cost you sonically? The issue of modern CD and digital volume levels has been beaten to death, but to explain it simply: the louder the overall volume of your master is, the quieter the louder elements in your mix will seem. The loudest elements in a mix are usually the drums and vocals. When loud transients like kick and snare hits are pushed further into peak limiters and clipping, the information suffers more because it’s being lopped off and smeared the louder the overall level of the song becomes. Therefore, a really loud master usually loses a lot of transient punch and detail. It’s also bad for the mastering engineer’s soul, but that’s the least of our concerns! This is just an unfortunate fact of life and though things can be done to mask this side effect of really loud audio, the truth is that at the end of the day a more dynamic and less compressed/limited master will sound much better over extended listening periods. We want your fans to get through the whole record, and not be prompted to turn it off because of listening fatigue. DO I NEED A DEDICATED MASTER FOR VINYL? I always recommend to my clients who plan to release their project on vinyl that we record an alternate version of the master with little to no digital peak limiting, and a little more headroom in the analog domain. Having worked with many of the most well respected lacquer cutting engineers in the industry, I’ve learned that an alternate master prepared with these characteristics rather than a peak limited master intended for digital formats will just sound better. Sending a loud and aggressive CD master to a lathe will only cause the cutting engineer to have to turn things down significantly, and in many cases they’ll be forced to cut an even quieter record than they would have with a more dynamic premaster. You’ll retain more transient impact (punchier drums), smoother highs and tighter lows, and just a more natural and musical sounding record. The cost is minimal, and the benefits are significantly more. Your premaster for vinyl doesn’t need to be as loud as your CD master because the volume of your vinyl will be determined by the length of the sides, and the integrity of the sonics. We can work together to determine how to maximize the potential of your vinyl release, particularly by sequencing for the format… which means to keep louder more aggressive material near the outer edge of the record (early in the side sequence), and the more subdued and less aggressive tracks near the inner grooves (where noise and distortion become more of a consideration). Having said all of this, you can still cut your CD/digital masters to vinyl if you don’t have the budget for these alternate versions. Let’s discuss these options in more detail while we’re working on your project and decide on the best approach, both economically and sonically. WHAT ARE ISRC CODES? DO I NEED THEM? ISRC codes (International Standard Recording Code) are identification codes for each song on your recording. They make sales of your music trackable so that you can get paid when people buy your music through digital retailers like iTunes. To obtain a unique prefix for your ISRC codes, you must register via this website: www.usisrc.org. Some digital distribution services will take care of this step for you so it depends on the circumstances of your release. We are not a registered ISRC vendor here at SRA so you will have to provide us with codes to embed as metadata on your DDP or PMCD (physical). Please email any other questions on the subject and we’ll get you started. HOW DO I GET MY CD INFO TO DISPLAY IN ITUNES? Media players like iTunes refer to the Gracenote Database to identify album information like artist and song titles. The Gracenote database provides album information to the following media players: iTunes, WinAmp, Quintessential Media Player, and Finder (Mac OS). The AllMusic database provides album information to the following media players: Windows Media Player, Rhapsody, and Real Music Player. AllMusic registration can be completed by following the steps outlined on their website. 1. Open the iTunes store application on your computer. 2. Insert your CD, but do not import it to your computer. 3. If you haven’t already, fill out all album information (album name, artist name, album genre, track names, etc.). 4. Once you’ve done this, highlight all tracks. Then go to the “advanced” drop down menu and select “submit CD track names.” This will send your data to Gracenote. 5. Within 24-48 hours, your track names should load when you put your CD into any computer. DO YOU DO ATTENDED SESSIONS? Attended sessions are always welcome. The studio is located in New Windsor, NY which is about an hour north of Manhattan, and just a 15 minute drive from the Beacon train station. Let me know your situation and we’ll get you here!